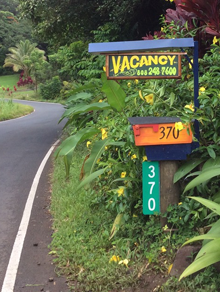 Entabeni Cottage vacation rental is located on a gorgeous tropical flower farm with a wide view of the Pacific Ocean above the world famous "Road to Hana" along the north shore of Maui. Hawaii has its own time zone (HST). We don't change our clocks. If we don't answer the phone at the time of your call, please leave a message and we'll get back to you as soon as we can. Mahalo - Thank you for visiting our web site. We're looking forward to hearing from you!